« Lose – ah.. USE the Lightwell. Right now we are running a little heals heavy. By heals heavy it doesn’t necessarily mean that all the healers are available all the time. So mostly it works out that we seem to always have enough healers around, and a couple of healers that can do offspec dps if we need the dps, but sometimes a healer or two, or a dps or two will need to bench warm for a boss. Sometimes while we were working on hard modes, this would mean a significant part of the raid night, and then we would slowly lose our bench warmers to alts, or they would just would log off and not come back, with no response in guild chat/vent when they were called on. Now hard mode attempts still may take a couple of goes, and the bench warmers know not to go too far. But we still have Spine and DW hard modes to work on and that means likely some time will be spent by someone on the bench. The problem with sitting is that you have set aside time, been prepared for raid and some of that time – unspecified time may be spent not doing what you wanted to do with that time, and instead have to find other things to do that keep you reasonably available when/if you are called on. You might get in a Pvp game, but you also may not get to finish it, start farming, start something. When volunteers were called the other night, one raider said they would sit if they had to, but they just want to raid. Bench warming isn’t killing bosses. It is still being part of a team though, because the reality also is, if you don’t have bench warmers, then you have the possibility of not having enough players at a time when random things happen, and people aren’t available – and we want to do hard modes which means we need the 25 people in the raid. Having people ready in reserve, helps make a healthy raiding guild. 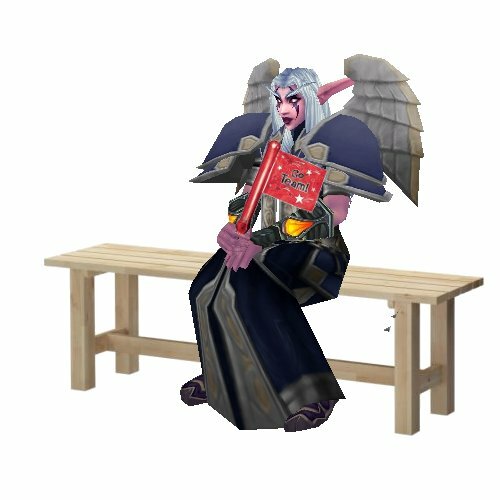 I’ve bench warmed, I’m getting better at volunteering for it, but I’ve raided with people in flexible positions ( eg not tanks or raid leaders ) who refused to sit. Ever. I understand why they don’t volunteer. You’re there to raid, you want to raid. You’ve committed. A raid can still be done with less than 25 or less than 10 – but never more. However there has to be a Tank/heals/DPS balance for the content especially the harder kind. Once the content gets easier because of nerfs or better gear then the balance can be shifted, but unless there is an achievement in it most guilds will try to run their current content with full raid groups, especially when encounters aren’t designed as tank and spanks where everyone stands in one position the whole time, and a couple of people pushing a little harder could compensate for lesser numbers. You have oozes that have die by a particular time, damage that needs to be healed up, targets that need to die before you move to the next one. Bench warming is also where good guild leadership comes in. You also need to keep your bench warmers warm. Keep them interested. Keep them committed, to the point that there are no bench warmers per say. They are not reserves, only put into play in extreme circumstances, they are raiders, but for that to happen, you need people to volunteer to sit out. So the change of thought is that you’re not being sat because they don’t want you, but it’s to give someone else a chance at… ( encounter, fight, loot ect.. ) It makes the raid group stronger. If in the event a player is not available then you have someone in the position to be there instead, and the show goes on. One of the toughest aspects of raid leading is deciding who sits on the bench. Have a chat to our guild leader though (if you haven’t already). She can set one of your alts up to get EP/GP for your main, so you can do dailies and stuff and your alt is in the raid group, collecting points. I think this was the purpose of archaeology. to give bench warmers something to do that provides rewards, requires significant time investment while still allowing players to switch to a different activity at a moment’s notice. well that, or fishing.